KRATER COMEDY CLUB: Until April 8, 7pm/8pm/10.30pm, £5-£36.50 Komedia, 44-47 Gardner Street, Brighton 0845 293 8480. LEWES RIVERSIDE CLUB: Old Bear and Friends by Jane Hussey (author), 2pm St Thomas’ Church Hall, Cliffe. SEAFORD COMMUNITY CINEMA: Barn Theatre, Saxon Lane, 7.30pm. Breathe (12A). Tickets £6/£5/£3.50. Available from Seaford Tourist Information Centre, 37 Church Street, 01323 897426. TALK: Friends of Ann of Cleves’ House talk, The Street Names of Lewes by John Davey, 7.30pm Anne of Cleves’ House. Email annacrabtree1@hotmail.com. WALK: Meet 10am at the car park in Village Way, Cranleigh GU6 8AF at the Leisure Centre end (£1.50 charge for three hours). Flat 5 mile HDC walk, muddy in places. Good views of the North Downs, Manor Houses and cottages hidden away in the Surrey countryside. 2 hours. Margaret 01403 262311. LORRAINE HUGHES: Free, 10am-4pm Fri/Sat until April 28. Lorraine Hughes Art Exhibition. BOWIE EXPERIENCE: £25.50, 7.30pm The Hawth Theatre, Crawley (01293) 553636. The Golden Years Tour. FUNK CITY: Railway Inn, Billingshurst, 9pm. GIGNITE: Flying Low, Manbitesdog and Loathsome Guts, The Shelley Arms, Broadbridge Heath, 8pm. JOE90: Horsham Sports Club, Horsham, 8pm. SOVEREIGN SEAS FOLK FESTIVAL: £18 for all concerts (tickets for individual concerts are available), 2pm/7.30pm (1.30pm April 8) RNLI Newhaven Lifeboat House, Riverside, West Quay, Newhaven. With three concerts, two on Saturday and one on Sunday at 1.30pm. THE HANGEE V: Free, 8pm Lewes Con Club, 139 High Street, Lewes 01273 473076. Plus Space Agency. THE MAYOR’S 60S NIGHT: £12.50, 7.30pm Under Ground Theatre, Grove Road, Eastbourne 0845 680 1926. With Southern Spirit. ALL STAR SUPERSLAM WRESTLING: £11.50-£16.50, 7.30pm White Rock Theatre, Hastings (01424) 462288. Brand new line-up of international stars. ANNIVERSARY APRIL: £5-£6, 7.45 until April 20. Various events to help New Venture Theatre celebrate 70 years in Brighton. TRIP THE LIGHT FANTASTIC: £10-£15, 7pm and April 7 (Sat mat 2.30pm) Chequer Mead, East Grinstead (01342) 302000. Cora Theatre Arts (youth production). MILTON JONES: Is Out There. £26, 8pm De la Warr Pavilion, Bexhill (01424) 229111. Brand new show. 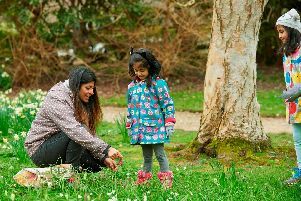 ARLINGTON BLUEBELL WALK: And Farm Trails, open daily 10am-5pm until May 13. details at bluebellwalk.co.uk. CATS PROTECTION FUNDRAISER: Roffey Millennium Hall, 2pm-4pm. On sale will be home-made cakes, branded gifts and goodies, books, jewellery, DVDs and CDs, plus a Tombola stall. Refreshments will be available. Admission is free but donations (including cat food and litter) are warmly received. Visit www.cats.org.uk/horsham. CRAWLEY HORTICULTURAL SOCIETY: Spring Show, 1.30pm-4pm, Horticultural Hall, Ifield Avenue, West Green, Crawley. Next to the ambulance station. All visitors are welcome. Refreshments are available. For more information about the Horticultural Society visit crawleyhorticulturalsociety.org.uk. HORSHAM AND DISTRICT HORTICULTURAL SOCIETY: Annual spring show and plant sale. There will be a cookery, handicrafts, paintings and drawings section. Public viewing from 2.15pm to 3.45pm before trophies are awarded. There will also be a grand raffle, refreshments and plants and rhubarb for sale. North Heath Hall, St Marks Lane, Horsham. All welcome, entry by donation. JUMBLE SALE: Two day jumbo jumble sale from 10am-2pm at All Saints Centre, Friars Walk, Lewes. April 7/8. MID SUSSEX RAMBLERS: The Borough, 8 miles with Alison G 01273 833794. Meet outside Borough Underground Station near London Bridge, 10am. RNLI Quiz Night: Test your knowledge while supporting a good cause. Teams of up to six people. Hurstpierpoint’s Village Centre from 7pm for a 7.30pm start. Prizes awarded for 1st, 2nd and 3rd place. Raffle, bar serving beer, wine and soft drinks. Tickets £10 per person (includes a light supper) from Mishon Mackay, Hurstpierpoint, or Orion news, Hassocks. Or call Philip Eastell on 07749 278992. WALK: Meet 10am in the Warnham Village Hall car park in Hollands Way RH12 3RH. Three mile HDC walk, some hills and stiles, past Warnham Manor and across the deer park. Dogs on a lead. 1¾ hours. Liz 01403 263920 or Simon 01403 260599. ALMATHEA: Free with ticket, 7.30pm Westgate Chapel, High Street, Lewes. Flute and harp duo. BALCOMBE CLUB: Raising money for St. Catherine’s Hospice and Cancer Research. Two bands will be performing. Headlining will be The Ruts DC, supported by Stop Press, plus the Morgellons and a DJ set, all for £12 per ticket. CROSSFIRE: The Kings Head, Billingshurst, 9pm. FOREVER DUSTY: £15-£17, 8pm The Royal Hippodrome, Eastbourne (01323) 802020. The music of Dusty Springfield. FURIOUS BADGERS: Broadbridge Heath Village Centre, 8pm. HORSHAM ROCKS PRESENTS: Sam Clayton, The Carfax Bandstand, Horsham, 2pm-4pm. JO, CHRIS AND GRAHAM: Free, 10am-noon at the regular coffee morning, Under Ground Theatre, Grove Road, Eastbourne 0845 680 1926. JUKEBOX 6: The Bedford, Horsham, 8pm. LAUGHING STOCK: £8, 7pm Komedia, 44-47 Gardner Street, Brighton 0845 293 8480. Talk Talk Tribute. LEWES SATURDAY FOLK CLUB: £6, 8pm Elephant and Castle, Lewes. Session with Roger Stamp and Friends. LINDISFARNE: The Capitol Theatre, Horsham, 7.30pm. NO JACKET REQUIRED: £21.50, 7.30pm The Hawth Theatre, Crawley (01293) 553636. The Phil Collins Tribute. PUBLIC SERVICE BROADCASTING: £28, 7pm Brighton Dome (01273) 709709. Plus support, Jane Weaver. EASTBOURNE’S GOT TALENT 3: £6, 7.30pm Under Ground Theatre, Grove Road, Eastbourne 0845 680 1926. In aid of Macmillan Cancer Support. WEST END EXPERIENCE: £10-£13, 7pm White Rock Theatre, Hastings (01424) 462288. Easter Youth Project 2018. TEZ ILYAS: Teztify. £10-£12, 8pm Komedia, 44-47 Gardner Street, Brighton 0845 293 8480. BEACHY HEAD RAMBLERS: Under and Over, 11 miles with Alan H 07976 083766. Meet at Buckle car park, Seaford, 10am. LEWES FOOTPATHS GROUP: Tenth Anniversary Greenwich Meridian Trail Blizzard Walk, Peacehaven to Lewes, 8 miles with Hilda and Graham 472678 (picnic lunch). Meet at Lewes Railway Station, 9.33am train to Newhaven then No 12 bus to Peacehaven. WALK: Every Sunday and Wednesday Meet 2.30pm at the Museum in the Causeway, Horsham. Guided historical two-mile walk around Horsham to learn more about its history. Supported by The Horsham Society. 90 minutes. Jill 07780 701184. BRIGHTON CONSORT: 6pm, £14 (£12 concessions), St Wilfrid’s Church, Haywards Heath, www.brightonconsort.org.uk, 01273 833746, or tickets on the door. An Eastern Easter: seasonal choral music from Central and Eastern Europe. Includes soloists, instrumentalists from the Corelli Ensemble and Nick Houghton (chamber organ). LONDON PHILHARMONIC ORCHESTRA: £15-£25, 3pm Devonshire Park Theatre, Eastbourne (01323) 412000. From Venice to America. RTWSO: £20, 3pm Assembly Hall Theatre, Tunbridge Wells (01892) 530613. Walton’s Cello Concerto. WSO: £19-£28, 2.45pm Assembly Hall, Stoke Abbott Road, Worthing 01903 206206. RAF Centenary Concert. BEATLES DAY: £16, 11.30am White Rock Theatre, Hastings (01424) 462288. A day of Beatles music. ELAINE DELMAR: £15, 3pm The Hawth Theatre, Crawley (01293) 553636. Jazz singer. HERBIE FLOWERS: £7.50, 11am Brighton Dome (01273) 709709. Jazz breakfast. T.REXTASY: £23-£28, 7.30pm Theatre Royal, Brighton 0844 871 7650. The 40th Commemorative Anniversary Tour. MILKSHAKE LIVE: £12-£17, noon/3.30pm The Hawth Theatre, Crawley (01293) 553636. Starring Milkshake favourites. SAM JONES: £7, 3pm Under Ground Theatre, Grove Road, Eastbourne 0845 680 1926. Sam Jones’ Magic 4 Kids show. EVENING OF MEDIUMSHIP: With medium Gary Norgett. Refreshments and raffle, 7.30pm-9.30pm, £5, Barnham Community Hall. Yapton and Barnham SNU Spiritualist Pioneer Centre. HORSHAM HUMANISTS: The funny side of Humanism. From 8pm, upstairs at the Anchor Hotel, Horsham, free to all. Life’s too funny to be serious about it. Or is it the other way around? Humanists are free to find humour in all things. Come along and have a laugh. Bring some jokes, cartoons, funny stories, video clips, etc. Everyone welcome. LEWES HISTORY GROUP: Tales From The River Bank by Ian Everest, 7pm for 7.30pm at Kings Church building, Brooks Road, Lewes. Non members welcome £3. SUSSEX FAMILY HISTORY GROUP: Mrs Goodwin’s Little Book by Meryl Catty, 7.30pm in Bridge Cottage, High Street, Uckfield. THE ARTS SOCIETY STEYNING: Rupert Willoughby gives an illustrated talk on ‘Basingstoke and its contribution to World Culture: the modern post war architecture of an English town.’ Rupert is a prize winning historian who specialises in the domestic and social life of the past. A graduate with an honours degree in History from the University of London, he is the author of the best-selling ‘Life in Medieval England’, guides to castles owned by English Heritage and a series of popular histories of places including Chawton and Basingstoke. He contributes regular obituaries to The Times and The Daily Telegraph, writes privately commissioned histories of houses and is an experienced lecturer and occasional broadcaster on a broad range of topics, with a particular interest in architecture. Coffee is served at 10am. The talk is from 10.30am-12pm, The Steyning Centre, Fletchers Croft, Church Street, Steyning. RUMOURS OF FLEETWOOD MAC: £23.50, 8pm Assembly Hall Theatre, Tunbridge Wells (01892) 530613. 40 Years of Rumours. FLASHDANCE THE MUSICAL: £14-£49, 7.45pm until April 14 (Thurs/Sat mat 2.30pm) Theatre Royal, Brighton 0844 871 7650. ALEX WILLIAMSON: £17.50, 8pm Komedia, 44-47 Gardner Street, Brighton 0845 293 8480. Make The World A Banter Place. SUZI RUFFELL: Keeping It Classy. £10-£12, 8pm Komedia, 44-47 Gardner Street, Brighton 0845 293 8480. MID SUSSEX RAMBLERS: Ashdown and Chelwood, 7.5 miles with John 01444 483860. Meet at Ashdown Visitor Centre, 10am. WALK: Meet 10am in the Forestry Commission car park, Sedghurst Wood / Sidney Wood. Take Dunsfold road from A281 at Alfold Crossways; car park about one mile on left). 5½ mile HDC walk, mostly flat, through woods and along the old canal tow path. No dogs. 2½ hours. Geoff 01403 258180. CHESS: The Musical. £10-£12, 7.30pm until April 14 (7pm Sat) Lewes Town Hall. LOS Musical Theatre production. Tickets available from www.losmusicaltheatre.org.uk. MYTHS AND LEGENDS: £17, 2pm/7pm The Hawth Theatre, Crawley (01293) 553636. Deborah Lamb Theatre Arts. THE BEST OF DERREN BROWN: £23-£45, 7.45pm until April 14, Devonshire Park Theatre, Eastbourne (01323) 412000. Derren Brown, Underground. BEACHY HEAD RAMBLERS: Two Overs and One Run, 11 miles with Jennifer B. Meet at Woodingdean car park (on Falmer Road) 10am. GEOLOGY LECTURE: The Horsham Geological Field Club. Lecture at The Forest School, Horsham, 7pm for 7.30pm. ‘Lapis Lazuli’ talk by Dr.Chris Duffin, Scientific Assoc. Natural History Museum, London. Visitors welcome, £2. Info: Gill 01403 250371, Beryl 01403 254549. STORRINGTON FILM NIGHT: Organised by the Rotary Club of Storrington and Pulborough District. The next film will be Murder On The Orient Express. Starring Kenneth Branagh, Penelope Cruz, Judi Dench, and Derek Jacobi. The Agatha Christie classic, with her detective Hercule Poirot . Screening at 7.30pm, Sullington Hall, Thakeham Road. The May 9 film will be Paddington 2. Tickets £5 from the Card Shop in Storrington. Any unsold tickets will be available on the door, on the night. There is a bar and a raffle during the interval. Anyone requiring transport should contact Roger Jamieson on 01798 813956 Info: Ken Collins 01903 740745. SUSSEX FAMILY HISTORY GROUP: The Chattri Memorial by Davinder Dhillon, 7.30pm in the Ventnor Hall, Blatchington Road, Hove. TALK: The Arts of Japan: Highlights of Japanese Art and Culture, 2pm Uckfield Civic Centre. Members free, non-members £7. The Mid-Sussex Franco-British Society: Haywards Heath, www.midsussexfrancobritish.co.uk The next meeting will be held on April 11 (8pm-10pm) in the Function Suite, Clair Hall, Perrymount Road, Haywards Heath. A talk in French by René Gimpel, Art dealer in London and Paris, grandson of marchand de tableaux, René Gimpel 1881-1945. ‘Marchand de tableaux, une perspective trans-Manche’. All members and visitors welcome. Info: Secretary, Mrs. Barbara Stevens, 01444 452385, dandbstevens@btopenworld.com. The annual Society membership fee is £20, payable in September. Visitor’s fee is £4 per evening, payable at meetings. WALK: Meet 10am at Henfield Library, High Street, Henfield. A gentle 2-3 mile HDC Health walk around the twittens, ginnells and snickets of Henfield. Walk can be extended if walkers wish. No dogs. 1 hour. Anne 01273 493671. JOSIENNE CLARKE: £12.50, 7.30pm Komedia, 44-47 Gardner Street, Brighton 0845 293 8480. And Ben Walker. POP DIVAS LIVE: £15, 6pm Assembly Hall Theatre, Tunbridge Wells (01892) 530613. THE BLUEJAYS: £24, 7.30pm White Rock Theatre, Hastings (01424) 462288. Rock and Roll Revolution. GRUMPY OLD WOMEN TO THE RESCUE: £17, 7.30pm The Hawth Theatre, Crawley (01293) 553636. Starring Jenny Eclair, Dillie Keane and Lizzie Roper. POETRY CAFE: Free, 8pm Under Ground Theatre, Grove Road, Eastbourne 0845 680 1926. With a guest performer. SWAN LAKE: £12.50-£20, 5pm/8pm Chequer Mead, East Grinstead (01342) 302000. Vienna Festival Ballet. HAYWARDS HEATH CERAMICS GROUP: Monthly meeting. Talk on ‘New Hall and Related Factories’ by Pat Preller. Pat is an expert on Printed British Pottery and Porcelain and has had two books published on the subject of New Hall. Lecture in the Studio, Clair Hall, 10.35am. Doors open at 9.45am with coffee served until 10.20am. Non-members are very welcome by prior arrangement with the membership secretary (01444 483372 or 414477), tickets £8. Info: hhcg.org.uk. Horam & Heathfield Flower Club: Floral evening – a demonstration by Wendy Parsons, Heathfield Community Centre, Sheepsetting Lane, Heathfield, visitors welcome, £5, sales table, raffle and refreshments. Call 01435 408605. POLEGATE RAMBLERS: Exceat Hope Bottom to Seaford Head, 5 miles with David and Sheila 500877. Or, 1066 And all That, 11 miles with Peter 01424 844219 (picnic lunch). Meet at Wannock Road Recreation Ground, 9.30am. TALK: The Pre Raphaelites by Jackie Parry, 2.30pm, Clair Hall, Haywards Heath (RH16 3DN), open to all. Info: 01444 455803 or 01444 441128. WALK: Welcoming in the Wheatears, a Sussex Wildlife Trust walk to spot and learn about one of the first migrant birds to return to Sussex from Africa. Meet at the bridge on Cliffe High Street, Lewes, 10am. Members free, donations requested. WALK: Meet 10am, Milton Heath and The Nower free car park (height restriction 2m), off Westcott Road, Dorking RH4 3JT. New, undulating 5½ miles HDC walk, passing a pretty mill cottage and waterfall, before a steep climb. Good views to Ranmore and Boxhill. No stiles. No dogs. 2¾ hours. Lynne 01403 268157. JAWS IN CONCERT: £30-357.50, 7.30pm Brighton Dome (01273) 709709. Film accompanied by Czech National Symphony Orchestra. IAN SIEGAL BAND: £16, 7pm Komedia, 44-47 Gardner Street, Brighton 0845 293 8480. Plus Dawn Brothers. THE ILLEGAL EAGLES: £27, 7.30pm The Hawth Theatre, Crawley (01293) 553636. THE MEKONS 77: £14, 7.30pm Lewes Con Club, 139 High Street, Lewes 01273 473076. Tickets in person or from Union Music Store, Lewes. WALK RIGHT BACK: £21, 7.30pm Assembly Hall Theatre, Tunbridge Wells (01892) 530613. The Story of The Everly Brothers. DAD’S ARMY RADIO HOUR: April 12, 8pm, £16, The Capitol Theatre, Horsham, 01403 750220. GUESS HOW MUCH I LOVE YOU: £9-£13, 4pm (11am/1.30pm April 13) The Royal Hippodrome, Eastbourne (01323) 802020. MOTHER’S RUIN: £17.50, 8pm Pavilion Theatre, Marine Parade, Worthing 01903 206206. A Cabaret About Gin. OPEN STAGE NIGHT: Free, 7.30pm Under Ground Theatre, Grove Road, Eastbourne 0845 680 1926. All performers welcome. THE JUNGLE BOOK: £12-£14, 2.30pm Chequer Mead, East Grinstead (01342) 302000. Immersion Theatre production. Duke Of York’s (0871 902 5728): Dementia Friendly Screening: Gigi (PG) Fri 11.00. Kids’ Club: Coco (PG) Sat 10.30. Studio Ghibli: Howl’s Moving Castle (U) Sun 12.00. Distant Sky – Nick Cave And The Bad Seeds Live (15) Thu 6.30. New Park (01243 786650): Journey’s End (12A) Fri 12.45; Sat 12.15; Sun 6.15. Preston Sturges (PG) Fri 1.30. Mary Magdalene (15) Fri 3.15; Sat 6.00; Mon 6.00; Tue 3.15; Wed 2.15; Thu 6.00. My Golden Days (15) Fri 6.00; Tue 8.30; Thu 3.30. Three Billboards Outside Ebbing, Missouri (15) Fri 8.45; Sat 8.45; Sun 12.45; Mon 1.00; Tue 6.00; Wed 4.45; Thu 8.30. Cyrano De Bergerac (PG) Sat 2.30. Bolshoi: Giselle (PG) Sun 3.30. Coco (PG) Mon 3.30; Tue 12.45; Wed 12.00; Thu 1.00. Arts Centre (01483 278000): GSC Bard Walk Documentary Film And Talk (tbc) Wed 7.30. The Hawth (01293 553636): RSC Live: Macbeth (12A) Wed 7.00. Curzon (01323 731441): Isle Of Dogs (PG) 1.50, 4.00. Pacific Rim: Uprising (12A) 2.15, 5.10, 8.05. Peter Rabbit (PG) 1.45, 3.55, 6.00. Darkest Hour (PG) 8.00. Lady Bird (15) 6.05, 8.15. The Greatest Showman (PG) Sat & Sun 12.10. Scott Cinemas – The Atrium Cinema (01342 321666): Peter Rabbit (PG) Sun 10.10. Bolshoi Ballet: Giselle (12A) Sun 3.00. Silver Screen: Paddington 2 (PG) Wed 10.10. RSC: Macbeth (12A) Wed 7.00. Pavilion (01323 841414): Peter Rabbit (PG) Fri, Sat, Tue & Wed 11.00, 2.15; Sun & Mon 2.15; Thu 11.00. The Shape Of Water (15) Sat-Wed 7.45; Thu 2.15, 7.45. The Capitol (01403 750220): Duck Duck Goose (PG) 10.30, 1.00, 3.15, 5.30 (not Sun); Sun 2.15. A Wrinkle In Time (PG) Fri, Sat, Mon, Tue & Thu 11.00, 1.45, 4.45; Sun 4.45; Wed 11.00, 1.45. Darkest Hour (PG) 7.15 (not Tue); Tue 2.15, 5.10, 7.15. I, Tonya (15) 7.45. NT Encore: Julius Caesar (15) Sun 2.30. Horsham Film Society: Elle (18) Mon 8.00. RSC Live: Macbeth (12A) Wed 7.00. Depot (01273 525354) (lewesdepot.org): Ready Player One (12A) Fri, Sat, Mon & Wed 2.00, 8.00; Sun 2.00, 5.00, 8.00; Tue 3.00, 5.00, 8.00; Thu 2.15, 5.15, 8.15. Ready Player One – 3D (12A) Fri, Sat, Mon & Wed 2.00, 8.00; Sun 2.00, 5.00, 8.00; Tue 3.00, 5.00, 8.00; Thu 2.15, 5.15, 20.15. Peter Rabbit (PG) Fri & Wed 11.15, 1.30; Sat 1.15, 3.30; Sun & Mon 1.30, 3.45; Tue 12.45, 1.45; Thu 1.00, 3.40. Isle Of Dogs (PG) Fri 3.45, 6.00, 8.30; Sat 3.45, 5.45, 8.15; Sun & Mon 6.00, 8.15; Tue 6.15, 8.15; Wed 3.50, 6.00; Thu 3.15, 5.30. I Got Life! (15) Fri 2.00, 4.15, 6.30; Sat 1.30, 6.15; Sun & Mon 4.00, 6.15; Tue 4.00; Wed 4.00, 8.15; Thu 6.00. Unsane (15) Fri 8.15; Sat, Sun, Mon,Tue & Thu 8.30; Wed 6.10, 8.30. My Life As A Courgette (PG) Sat 11.00; (Relaxed Screening 11.30); Sun 11.45; Mon & Tue 12.00; Thu 1.45. Singin’ In The Rain (U) Dementia Friendly Screening: Tue 2.00. Mary And The Witch’s Flower (PG) Tue 6.00. Distant Sky: Nick Cave Live (12A) 8.00. Windmill Cinema (01903 715920): Peter Rabbit (PG) 12.00, 2.00, 6.15 (not Sun); Sun 12.00, 6.30. A Wrinkle In Time (PG) Fri, Sat, Mon, Tue & Thu 4.00; Sun 4.15; Wed 8.15. Black Panther (12A) Fri, Sat & Mon 8.15; Sun 8.30. The Greatest Showman – Sing-A-Long (PG) Sun 2.00. Finding Your Feet (12A) Tue 8.15. The Greatest Showman (PG) Wed 4.00. Suffragette (12A) Thu 6.15. Seaford Community Cinema, Barn Theatre (www.seafordcinema.org): Breathe – With Writer Q&A (12A) Fri 7.30. The Picture House (01825 764909): Ghost Stories (15) Fri-Sun 6.35, 8.40; Mon-Thu 6.30, 8.35. Peter Rabbit (PG) Fri & Sat 11.15, 1.40, 3.40, 4.10; Sun 11.15, 1.15, 3.15; Mon & Tue 11.15, 1.35, 3.35, 4.10; Wed 10.10, 12.10, 2.10, 4.10; Thu 11.15, 1.15, 3.15, 5.15. Isle Of Dogs (PG) Fri, Sat, Mon & Tue 1.45, 6.10; Sun 4.20, 6.10; Thu 2.15, 4.20. Ready Player One (12A) Fri 1.30, 5.45, 8.20; Sat 5.45, 8.20; Sun 1.30, 5.15; Mon & Tue 1.30, 5.40, 8.20; Wed 11.00, 3.30; Thu 11.00, 4.45. The Greatest Showman (PG) Fri, Mon & Tue 11.30, 4.20; Sat 11.30, 2.00; Sun 12.00; Wed & Thu 2.00. A Wrinkle In Time (PG) Fri, Sun & Tue 11.00; Sat 4.15; Wed 10.30; Thu 11.30. Three Billboards Outside Ebbing, Missouri (15) Fri-Tue 8.30. Saturday Morning Movie: Coco (PG) Sat 10.30. Bolshoi Ballet: Giselle (12A) Sun 3.00. RSC Live: Macbeth (12A) Wed 7.00. Distant Sky: Nick Cave And The Bad Seeds In Copenhagen (15) Thu 8.00; 8.15. Dome (01903 823112): A Wrinkle In Time (PG) Sat & Sun 10.20. Peter Rabbit (PG) Sat & Sun 10.00. Connaught (01903 206206): A Quiet Place (15) Fri-Tue 8.30; Wed 3.15; Thu 5.45. Saturday Morning Pictures: Paddington 2 (U) Sat 10.15. Mary And The Witch’s Flower (PG) Tue 6.15. RSC: Macbeth (12A) Wed 7.00. Distant Sky: Nick Cave And The Bad Seeds – Live In Copenhagen (15) Thu 8.30.